Rose Gold Plated Necklace Trace Chain with Clasp 18"
Make an eye-catching sparkling necklace for special occasions or as gifts for family and friends using the NEW Swarovski crystal fancy stones in oval and drop shapes. 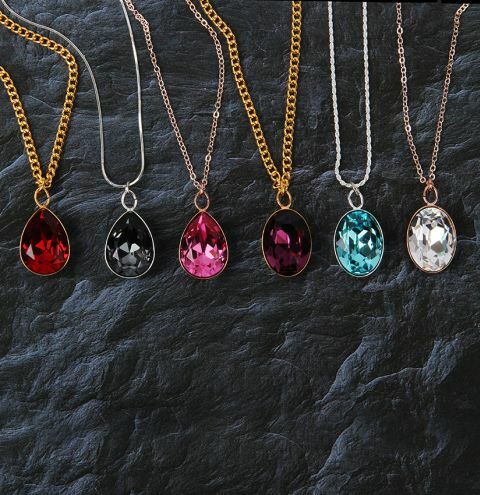 See more Swarovski crystal fancy stones and your matching setting charms. Close the loop on the setting charm. Apply a small drop of Gem-Tac glue to the setting and carefully place your Swarovski crystal inside it. Allow to fully dry, which can take up to 24 hours. Then open a jumpring and link it through the charm setting and use your pliers to close it onto the chain.